Nicole's Needlework: Four Down, Eight to Go! I'm trying to decide if I want to stitch it on 35 ct. WDW Onyx, or on 40 ct. Sienna Night (like Karin is using). I'll probably work on my stocking while I decide. :) Write later! You are really doing a wonderful job on the Houses. I love the way you used the the darker color in the windows. Yay on your HoHRH! Looking good! I love Miss Lila's House too. I may have to go for the Belle Soie conversion too. Sigh. Can't wait to hear if you start her! you have to love the conversions that Jean at the Attic does. she is great with conversions and almost always uses the Belle Soie. LOL If you ever make it out this way, you need to go to the Attic. Lovely stitching as always, Nicole. I think you should start the owl design by PSS. You beat me! LOL! I won't finish my #4 until the weekend. Your's is looking great. Do you have a lot of your pieces hanging or are you giving some as gifts? It's so much fun to finish each of those blocks. Miss Lila has been calling me from my WIP basket, so I need to devote some time to her. Love the conversion colors. Congrats on your finish! I can't wait to see your next start. Congrats on finishing the four houses - you go girl!!! 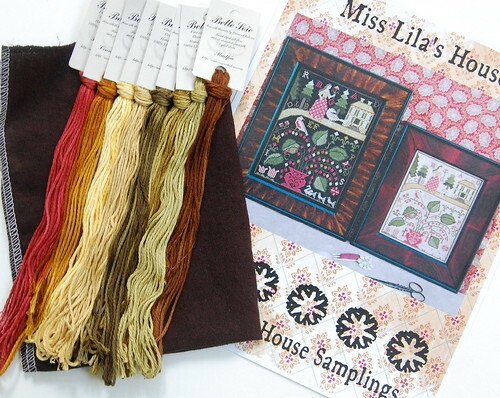 I got Miss Lila's House several months ago from Attic Needleworks but don't have the fabric or threads for it yet. Isn't is pretty? I love your HOHRH progress! The DMC threads are really pretty and I didn't realize you were using those. That is great since they don't cost as much as silk but still look this nice!! Congrats on getting your goal accomplished! Better late than never is what they say! I still consider (in my warped way of thinking) that you made it on time - whose up at that hour to check, right?). Your block looks great and I like the color changes you made to it! What you really mean to say is you want to FINISH something. lol What's it been since your last finish... an hour? Beautiful as usual... and you are entitled to a new start -- how else am I going to get my finishing-fix? Your looking are looking awfully pretty! I want to stitch this design one day. Your silks along that fabric- gorgeous!! Congratulations on finishing the fourth house. It is looking great! I absolutely love the windows in your houses! Beautiful stitching. HoHRH is looking awesome!! You are making fantastic progress! Houses is looking great! I really love the colors in Rubie Owl but haven't started it yet. Love your houses! I so want to get started on my Village but not until I finish my mini-redecorating project :-). I have stitched in a few days and I am having withdrawals. Love your HoHRH! It's so pretty. Can'tw ait to see your start on Lila :-). So beautiful, your Houses. Each time I see yours I want to continue stitching on mine. Soon, soon, there's just one exchange left to finish. Karin's Miss Lila on Siena Night looks terrific, so I'm looking forward to what fabric you will be choosing. Yippee, it looks great, Nicole. Each block is such an accomplishment. I love Miss Lila. The Attic's model is awesome. Your Houses look great! I'm glad you are using DMC on them - the colors just look so clear and pretty. Can't wait to see your progress on Miss Lila's House. It's another fantastic design! 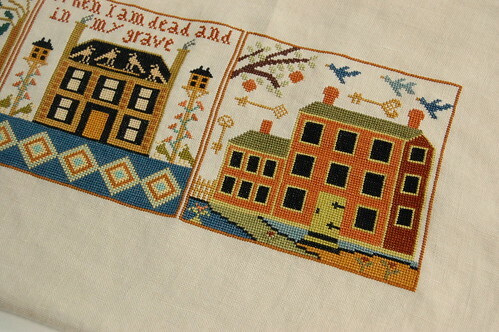 Congratulations on finishing another block - it's really lovely!